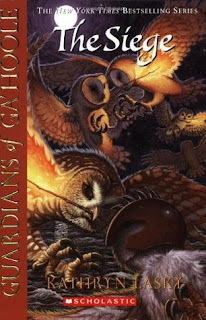 This is the fourth book in the Guardians of Ga'Hoole series, which I'm reading aloud to my younger daughter. I know I keep saying this, but this is my favourite book in the series so far, LOL! This series keeps getting better. This is more like 3.5 stars. There is a lot of danger and excitement in this installment. The Chaw of Chaws has as special mission to infiltrate St. Aggie's to determine if the rumors are true -- that the Pure Ones have already slipped in and are there to gain access to more flecks. Later in the book, the Pure Ones gear up for their assault on the Great Ga'Hoole Tree. Otulissa is growing on me. She's smart as a whip, and I agree with her plan! We are continuing on with the fifth book in the series, The Shattering.